The Films in My Life - a personal journal of cinema: Spooky movie suggestions? We're having major snowstorms in my neck of the woods, and I love it! I don't think it's snowed this much since I was in elementary school. Some of my favorite memories of being a kid include snow; I'd go out sledding with my friends, make snowmen and snow angels and have oodles of snowball fights. But my favorite part of snow days was coming inside! My mom would have hot chocolate, toasty pajamas right out of the dryer and my blankets and pillows all ready, waiting for me to get cozy on the couch to watch a movie. I might still go sledding, but all this snow has me in cozy mode. Despite a laundry list of things to do as tall as me (a petite 5' but still..) all I want to do is make some hot chocolate, snuggle with my blankets (and cat) and watch a movie. And no movies make me quite as snug-as-a-bug-in-a-rug as spooky ones! Any suggestions for spooky flicks are greatly welcome!! We're supposed to get a storm of epic proportions on Wednesday, so HOPEFULLY I can stay home and watch movies all day! Brainstorm is pretty creepy. It was Natalie's last movie and the whole concept is so weird and creepy and a little unsettling. You might want to check that out! I would suggest The Black Cat with Karloff and Lugosi, Val Lewton's Bedlam and Ghost Ship, and the Hammer classics The Mummy and Brides of Dracula. How about The Canterville Ghost? It's almost more of a comedy but Charles Laughton scares me to death every time! Or Rebecca? Highly spooky with creepy Mrs. Danvers and never knowing exactly what happened to Rebecca! 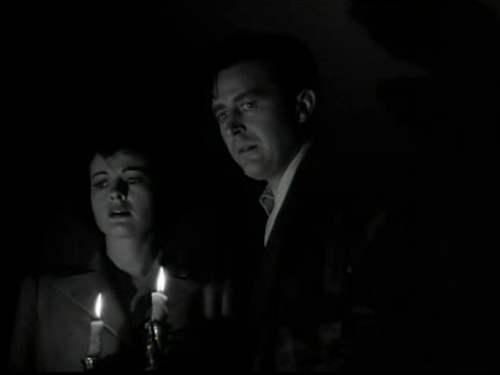 Cat People is really spooky, even though it's often considered more of a horror film. I had a great revelation and recommended The Ghost & Mrs. Muir, but I see Sarah already beat me to it while I was typing! SHEESH! I LOVE The Uninvited. Another good one along those lines I think is The Spiral Staircase. The Uninvited has been on my list for ages and I don't know why I haven't watched it. Sad times. I recommend The Innocents and The Night of the Hunter if you haven't seen them. The latter isn't a traditional spook story or anything but it sends shivers down my spine. 'Carnival of Souls' is definitely an incredibly spooky film. 'Nightmare Castle' is probably scarily bad (but good) as opposed to plain spooky. I can't think of many off the top of my head - I'm not a big fan of that kind of film as they spook me too much! Haha. The Innocents with Deborah Kerr would be a good choice too! Oh and I just wanted to point out that I am a foot and 1 inch taller than you. blugh I hate being a giant! more of a sci fi bent but the original invasion of the body snatchers is one creepy freakin flick!!! and i still say the original Frankenstein has maintained its ability to chill. i agree with Mercurie, Bedlam is a majorly unsettling film as is the Body Snatcher. Karloff is absolutely insidious in them both! also if one is looking for chills you cant discount the old Twilight Zone TV show either! i mean what's creeper than a little girls' doll saying "My name is Talking Tina and you'd better be nice to me!" damn, i came back to add Nosferatu and kendra beat me to it, lol! i agrew with the other 2 mentioned as well. i tell ya other film that creeped me out when i was a kid was Burnt Offerings. i have no idea how it would hold up now but it sure made me put my head under the covers when i was little, lol. I have always thought that "The House of Wax" with Vincint Price was really creepy! I watched that a a young girl and was up all night. I love "The Univited" too, and just wrote about it on my blog. The ghost images in that movie are what creeps my out. The one at the end looks too real! Two very spooky British movies I'm sure you'd adore if you haven't already seen them (though I'll bet you have): Night of the Demon (1957, Dana Andrews, fantastic performance by Niall MacGinniss, much better than the title suggests) and Dead of Night (1945). Ooh I thought of another! Portrait of Jennie. It's romantic, but still quite spooky. Definitely anything by Val Lewton is perfect: Cat People or even better the ultimate winter movie Curse of the People, which actually isn't particularly spooky but is still great. I always highly recommend Paul Landres rather obscure 50s vampire thriller Return of Dracula, which is really moody and creepy and sinister. Also perfect for chilly winter days: The Thing From Another World, with its creeping menace and sense of dread. I'll also second The Night of the Hunter and Rebecca. I recommend Dead of Night--a nice mixture of ghosts and creepiness (with a little humor tucked into one section to keep you from being totally tense). Thank you everyone for the suggestions!!! Hey am I too late to make a suggestion? I would recommend 1932's This Old Dark House with Boris Karloff, Melvyn Douglas, and Gloria Stuart. OOH Portrait of Jennie for the win!! I forgot about that one. i'll second Monty's suggestion and add that we mustnt forget Ernest Thesiger is in that too!! Another vote for "The Innocents" here. I've seen it several times & Netflixed it recently. I only get to watch movies before bed and I was too creeped out not to watch on a bright, sunny afternoon. & The one film I just can not watch alone is The Shining its so Eerie, but perhaps thats just me, some people don't find it very spooky. The haunting is good (original version NOT the remake) as is the bad seed, Rope or M. The silent Phantom of the Opera or Wind is good. If you want scarey acting I would suggest Show Girls. now THAT is terrifying! Forgot Fall of the house of Usher and the portrait of Dorian Gray. and Sweeney Todd with Angela Landsbury. Creepy fun.